One in three women will experience domestic violence (DV) in her lifetime. DV is frequently understood and responded to as an interpersonal issue, but there is significant research demonstrating the relationship between DV and a range of social issues. 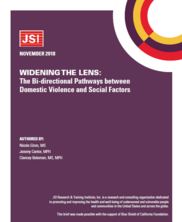 This brief provides a synthesis of the research connecting three interrelated social issues and DV, a short discussion of the broad social context in which patterns of DV occur, and a series of recommendations for decision makers, policy developers, and organizational leaders working to prevent DV in their communities. Examples of initiatives that are looking to address DV and related social issues simultaneously are also highlighted. A visual summary of this research is available in a companion infographic entitled “Cause & Effect: The Interconnection of Social Issues and Domestic Violence.” in English- and Spanish-language versions. JSI, 2018.